Models which help teach about planets and the solar system. Schools use many methods to help teach about the planets, the solar system and the moon. There are several pieces of specialist equipment available to demonstrate aspects of astronomy in the classroom. 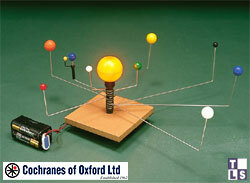 The equipment listed below includes the most popular types of Orrery, Planetarium and Tellerium. They are available to purchase directly from the manufacturers through their website www.cochranes.co.uk or through various lab supply company catalogues. Cochranes also stock a selection of spare parts and full instructions for all of their models. Because schools and age groups have different requirements and budgets, different models are available to teach the different aspects of the curriculum. This guide is aimed at helping you choose the right model for you. How many of the planets are shown? Does the sun light up (thereby shining light on the planets in a darkened space)? How are the planets moved (manually / motorised)? If motorised, do the planets move at their correct relative speeds? The brightness of the sun lamp and extent to which it mimics parallel rays from the Sun (important for getting good demonstrations of day/night, shadows and phases of the moon). The size of the Earth – large to get good shadow depictions. The Moon’s orbit – preferably between 12 and 13 times per year and at an angle to the Earth’s orbit around the Sun. This angle is why we do not get an eclipse every month. Models showing the stars. The principle features here are the detail of the model and whether it is arranged to represent what is seen from outside the universe or inside it! Model systems showing more than one aspect (e.g. the planets and stars). Planets orbit the Sun and the Moon orbits the Earth at their correct relative speeds. The planets can be positioned for any month up to 2020 and tracked forwards and backwards in time. A large Earth globe spins on its inclined axis and the Moon orbits it every 29 days. This arrangement is best for demonstrating the effects of day and night, seasons, phases of the moon and tides. The star dome sits on top of both arrangements. Size: 36cm (14 inches) diameter. For demonstrating the shape and motions of the solar system. The model includes a Sun that lights up with the planets as far as Pluto. The Earth has a moon. The planets can be moved around the Sun by hand, and the Moon around the Earth. Height: 10cm (4 inches). Diameter of largest orbit (Pluto): 40cm (16 inches). A teaching model of the Sun, Earth and Moon system with a 14 page booklet. The bright lamp and ‘sunbeam’ reflector cast clear shadows on the globe Earth. The Moon orbits at an angle to the ecliptic showing why eclipses do not happen every month. The model includes two sizes of Earth and Moon, a stick-on man and sundial, an eclipse shadow-card, and a phases-of-the-moon disc. The Model is hand-driven, with accurate gears driving the orbit of the moon and maintaining the Earth’s axis at 23.5°. The Tellerium is 62cm (24 inches) long and 28cm (11 inches) high for group viewing. A set of laminated posters printed to scale. Includes physical data about the planets and distances between them at the scale printed giving a real feel for the scale of the universe. Poster sizes: heights - planets 30cm (12 inches), Sun 49cm (19 inches), widths - various. The following table is a starting point to help choose the appropriate piece of equipment for you. It shows the subjects that can be studied using each model. 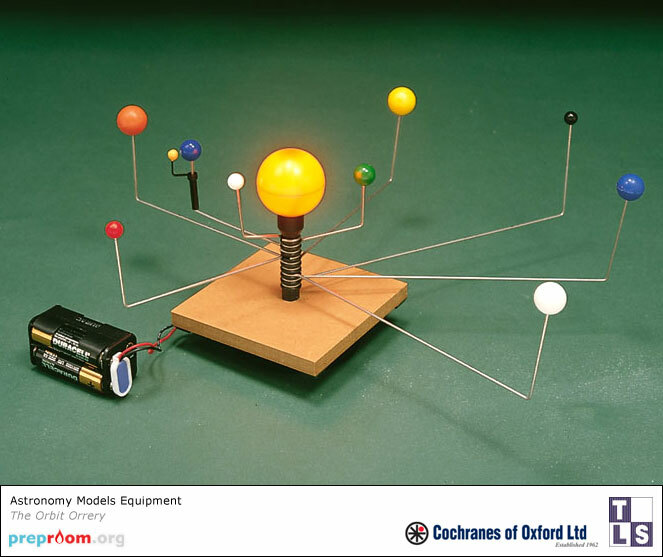 This includes detailed information about the Orrery and how it can be used in the classroom. It also includes example work material for pupils. Cochranes of Oxford Ltd. www.cochranes.co.uk Tel. +44 (0)1993 832868.